TO FEEL IN YOUR HOME? Changing the size of your home or transforming the look and feel of its interior, will make a HUGE difference to the way you feel about your life. 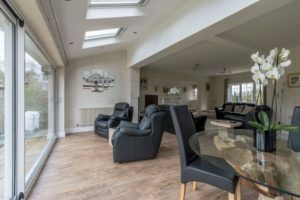 Or how about wiling away the summer evenings in a light and airy sunroom, creating an office so you don’t have to work off the kitchen table, or building a room just for the kids so you can keep their toy chaos out of the rest of the house? And if it’s your interior that needs updating, how about relaxing in a luxurious bathroom, retreating to a tranquil bedroom paradise (with en suite of course), or entertaining in a state-of-the-art designer kitchen? Whatever you desire for your home and your family, let Adamson’s unlock the potential in your existing home and create a sanctuary that perfectly matches your family’s personality and dream lifestyle. Plus, with over 30 years' experience, a fixed price and our unique “one-stop” for design, planning, building and interiors, creating your dream home is totally possible. simply fill out the form below to get yours.